Featuring a modern LCD interface, the Powerware 9155 UPS includes advanced IGBT rectifier technology for active 0.99 input power factor correction (PFC). The output with 0.9 pf rating is suitable for protection of today's high PFC compensated computers, servers, and other critical loads. A wide range of connectivity options makes the Powerware 9155 an ideal UPS solution for centralized IT server rooms, building systems and industrial automation applications. Incorporating exclusive Advanced Battery Management (ABM) technology, the Powerware 9155 features the ability to increase up to 150% battery service life compared to traditional charging method. 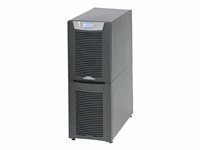 The 9155 UPS can be paralleled for both redundancy and capacity using patented Powerware Hot Sync UPS technology to deliver full uninterruptible power protection against all nine common problems.